The first strategy discussed in the Whole Brain Child is Connect and Redirect: Surfing Emotional Waves. The example used in the book is of an upset child coming to the parent shortly after going to bed, and the parent has to choose between redirecting the child or connecting and then redirecting. I’m sure we’ve all been there. You’re tired or already asleep and in comes your sweet child seemingly wide awake. A couple weeks ago, this happened to us in the middle of the night, and one exasperated parent sent Elise back to bed before hearing what she said which resulted in her stomping out and slamming her door – at midnight. (And you’re left thinking: lovely, now the baby will wake up and we are all awake and tomorrow is going to stink.) It was a good two to three hours before Elise could be calmed back down; take my word for it, sleep deprived parenting is not the best. 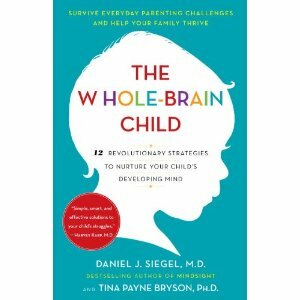 “The key here,” according to Siegel and Bryson, “is that when your child is drowning in a right brain emotional flood, you’ll do yourself (and your child) a big favor if you connect before you redirect.” I think the other key is that the redirecting is not always immediate. Sometimes the connecting takes time. Elise may need a snack and some one on one time before she is ready to discuss what happened. And we have definitely experienced letting the “emotional waves crash until the storm passes.” Mainly, we (Elise’s parents) have to work on keeping our cool and being patient – even in the middle of the night.